‘Caring for an overweight cat’ has been written as an information source and support tool primarily aimed at cat owners whose cats are overweight or obese. 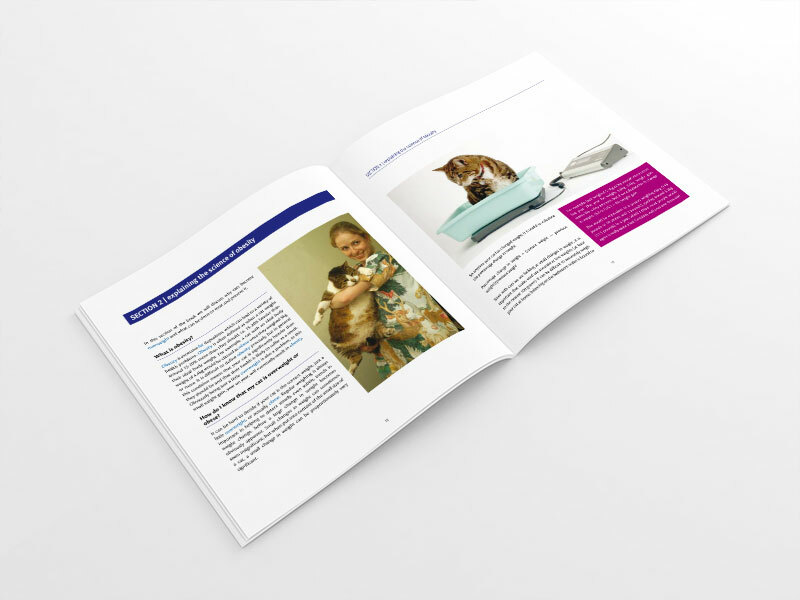 An 80 page fully illustrated book aimed at cat owners and veterinary professionals, launched January 2012. ‘Caring for an overweight cat’ has been written as an information source and support tool primarily aimed at cat owners whose cats are overweight or obese. It is also designed to be a resource for student veterinarians, veterinary nurses and technicians. The science and emotional aspects of dealing with an overweight cat are addressed. The book explains how to prevent and treat weight problems in cats. There are tips for maintaining motivation and achieving successful weight loss. 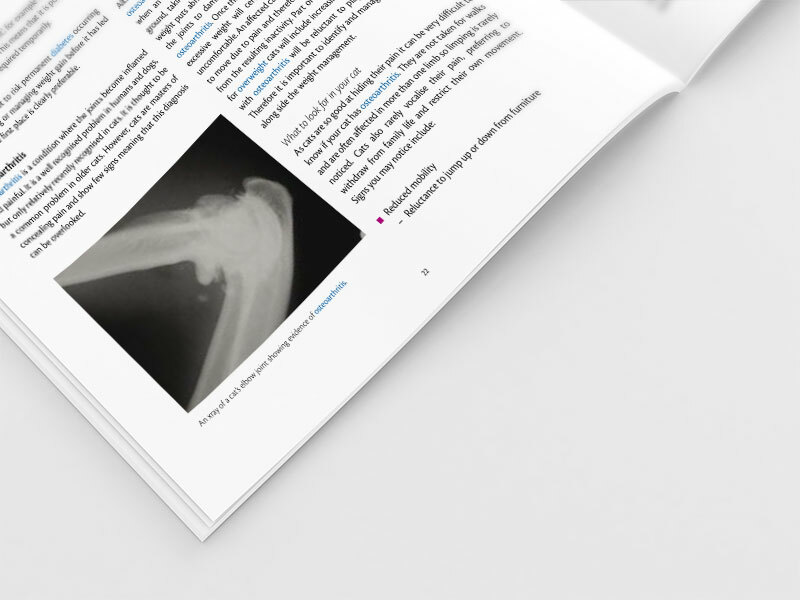 Several case studies are included to show how treatment can be successful and there is a glossary of terms used by veterinarians. All the evidence points to there being an obesity epidemic in owned cats throughout the world. It is therefore very timely that Andrea Harvey and Samantha Taylor have written a wonderfully lucid book to help cat owners remedy this situation. Although the title is about dealing with the overweight cat, the book is much more than that – it’s about educating owners on how to keep cats lithe and healthy, by strategies aimed to increase their level of activity and enriching their environment, while cutting back on the calories. The book is truly holistic – considering all aspects of feline health and lifestyle, to guide owners towards developing a strategy for reducing feline adiposity, while simultaneously improving nutrition, health and well bring. Adverse health repercussions of obesity, such as diabetes and arthritis are covered also. The book is easy to read and should prove especially useful to busy veterinarians, who may not have enough time to deal with all aspects of diet and exercise in the obese cat during a normal evening visit. This book should greatly reinforce what they tell owners in the consultation room, and help them make the most of the latest range of weight reduction diets. Andrea Harvey and Samantha Taylor have addressed the increasing problem of obesity in this comprehensive guide for all owners of overweight cats. They cover all the ‘need to know’ information about the health implications, how cats eat naturally and the owner’s role in their pet’s weight loss programme. This book is easy to read and contains some great practical tips. The case histories are informative and it’s always good to know that others have experienced the same issues with their pets! An excellent read and great addition to the Cat Professional series. FAT cats are a hot topic in the press at the moment; however, unfortunately we tend to focus more on overpaid bankers and less on our overfed moggies. This is a shame, as most owners tend to be unaware of the impact that the extra pounds carried by their feline companion may have on the overall health of their pet. How many times have we heard it said, ‘He’s not fat, he’s just a big cat’. This book, ‘Caring for an Overweight Cat’, is designed for exactly the purpose of raising awareness. 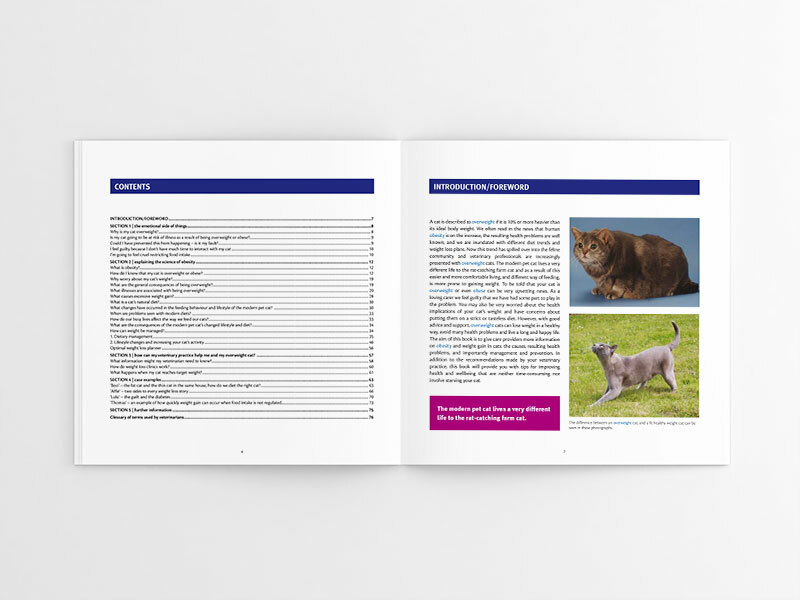 Aimed primarily at owners of obese cats, the book sets out with the aim of providing an information source and support tool for owners and a reference source for veterinary nurses, students and technicians. With the target audience in mind, the book takes a tactile approach, with the first section, entitled ‘The emotional side of things’, addressing questions such as ‘Is it my fault?’ and ‘Is my cat going to be at risk of illness as a result?’. The main section of the book covers the technical aspects of obesity. It includes discussion of the implications of obesity for other health problems and dietary management issues, and concludes with a section on the way the veterinary practice can help in the management of weight control. Some interesting case studies are also provided at the end. First impressions of this book are that it is not in any way intimidating, as a standard veterinary text might be to an owner; you can’t help flicking through the pages to look at the excellent pictures and colourful charts and diagrams. The layout of the book almost feels like an extended consultation, by addressing the owner’s concerns initially before moving into the detail and concluding with an action plan to go forward. For a book aimed at owners, this is a really key feature and one that enhances its usefulness. The initial section on the emotional aspects will ring true for many owners and covers a number of the questions that we often hear during consultations with owners. The rest of the book is equally engaging, and the clear contents section makes it easy to navigate to the section of interest. Veterinary nurses or technicians seeking a more in-depth analysis of the health issues, including the inflammation process associated with obesity, should note that this is not covered in detail in this book. It will, however, educate you on how to communicate what can be a delicate subject to owners. While nothing will replace the interaction with a vet or nurse in a consultation, having this book to hand will serve as a good reference point for owners in times of weakness, and for that matter would make a worthwhile addition to any veterinary waiting room. Caring for an overweight cat is an excellent book for anyone involved with the weight reduction programme of an overweight cat. The increasing obesity issue has shown that the veterinary profession has to seriously undertake client education and conduct weight reduction clinics in order to help increase the welfare of the pet population. This book acts as a superb source of information in an accurate, detailed, yet easy to read format. The book reinforces all the information that veterinary professionals would give regarding weight loss, and giving more details that weight reduction clinics would have difficulty covering within the consultation time. Having a superb resource like this that veterinary professionals can happily refer cat owners to is a lifeline to everyone involved in improving the welfare of the overweight cat. Caring for an Overweight Cat is an excellent source of information, not only for those with heavier cats, but for anyone who is intending to get a feline companion, as it enables readers to understand cats' normal behaviour and how the lifestyles that we impose on them can affect their health and well-being. Well-designed tables and charts illustrate body condition scoring and measuring, and the consequences of excessive weight gain are described in detail, with plenty of pictures. How to achieve weight loss is dealt with thoroughly and comprehensively, with step-by-step guidelines, tips and case examples, plus how to enlist the help of the vet and how to overcome some of the inevitable hurdles. As the debilitating condition of obesity in our feline friends becomes an increasingly reported welfare issue, this well-illustrated book, written by cat-owning RCVS Specialists in Feline Medicine, provides an easy-to-read, valuable source of information for all cat owners interested in safeguarding their cat's health and welfare - not just those who find themselves with an overweight pet. Discussing the natural or wild feeding behaviour and nutrition of cats provides insight into and understanding of how cats' diet and lifestyle has changed and why obesity is increasingly recognised in the modern pet cat. Differences between cat and human feeding behaviours are discussed, highlighting the great social significance people place on eating and feeding, compared with the solitary feeding habits of cats. Full of practical tips, this book features sympathetic guidance for achieving controlled weight loss while acknowledging there can be no quick fixes in feline weight loss programmes. Case studies help to apply the theory, including the story of 'Boo' which highlights not only the challenges but also the opportunities for success in feeding cats differently in multi-cat households. Fat cats are a hot topic in the press at the moment however unfortunately we tend to focus more on overpaid bankers and less on our overfed moggies. This is a shame as most owners tend to be unaware of the impact the extra pounds their feline companion is carrying can have on the overall health of their pet. How many times have we heard “he’s not fat, he’s just a big cat”. This book, Caring for an overweight cat, is designed for exactly that purpose. 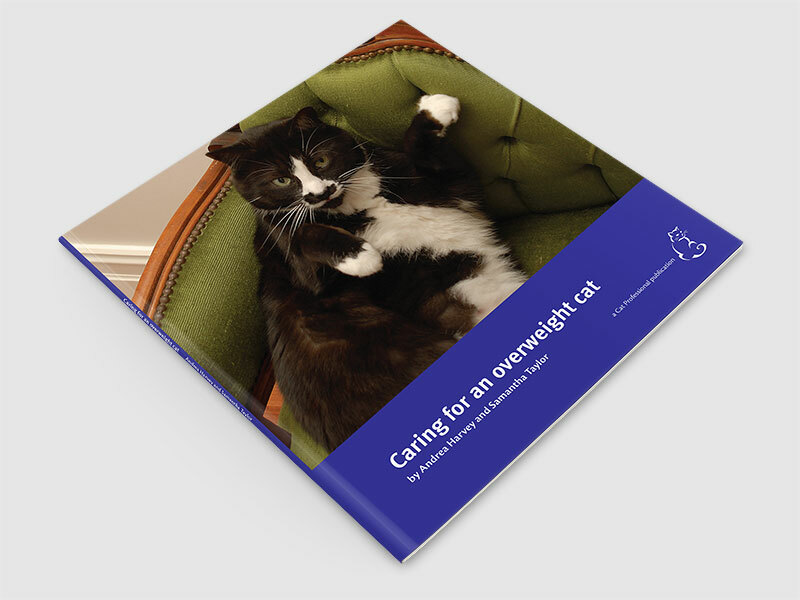 Aimed primarily at owners of obese cats, the book sets out with the aim of providing an information source and support tool for owners and a reference source for veterinary nurses, students and technicians. With the target audience in mind the book takes a tactile approach with the first section, entitled ‘the emotional side of things’, addressing questions such as ‘is it my fault’ and ‘is my cat going to be at risk of illness as a result’. The main section of the book covers the technical aspects of obesity including the implications of obesity for other health issues and dietary management issues before concluding with a section on the way the veterinary practice can help in the management of weight control and finally providing some interesting case studies. First impressions of this book are that it is not in any way intimidating, as a standard veterinary text might be to an owner, and you can’t help flipping through some of the great pictures and colourful charts and diagrams. The layout of the book almost feels like an extended consultation by addressing the owners concerns initially before moving into the detail and concluding with an action plan to go forward. For a book aimed at owners this is a really key feature and one that enhances its usefulness. The initial section on the emotional aspects will ring true for many owners and covers a number of the questions that we often see in consults with owners. The rest of the book is equally engaging and the clear contents section makes it easy to navigate to the section of interest. Veterinary nurses or technicians seeking a more in depth analysis of the health issues, including the inflammation process associated with obesity, should note that this is not covered in detail in this book. It will however educate you on how to communicate what is a delicate subject to owners. While nothing will replace the interaction with a vet or nurse in a consultation having this book to hand will serve as a good reference point for owners in times of weakness, and for that matter would make a worthwhile addition to any veterinary waiting room. Obesity is rife in the developed world, so it should come as no surprise that our companions are increasingly succumbing to what has become a Western epidemic. Domestic cats, once lithe hunters, now enjoy a pampered indoor existence and home delivered meals. Their quality of life has increased exponentially – along with their waistlines. cats present a weight loss challenge. They are notorious for nipping over to the neighbours for dessert, turning their noses up at lower-calorie fare and engaging in lounging marathons. Feline specialists Andrea Harvey and Samantha Taylor address these issues in Caring for An Overweight Cat. Pitched at owners of portly pets, the book is divided into five sections, with the first tackling what is often the elephant in the room: “the emotional side of things”. The authors are aware that shame, guilt and denial on the part of owners are barriers to weight loss in big cats. These issues – and their implications – are discussed in a non-judgemental manner. and lifestyle management. The authors provided a blueprint for a detailed weight loss plan which is realistic but safe, avoiding complications like hepatic lipidosis. It is refreshing that the discussion of pet food is not made with reference to any brands; a feature that I feel gives it more credibility where owners are concerned. The authors provide a trouble-shooting guide to common challenges (such as dieting an overweight cat in a multi cat household or dealing with a cat who solicits titbits off the neighbours). Section three covers the role of the veterinary practice in caring for overweight cats, explaining the importance of regular weigh-ins and diagnostic tests. It also provides instructions on managing cats once they have reached their ideal body weight. Section four provides a series of case examples – each with its own set-backs – showing how real cats lost weight. This reminds owners and veterinary professionals alike that weight loss setbacks can be overcome. Section five lists resources for owners seeking further information, although the book itself is a comprehensive stand-alone resource. As anyone who has counselled pet owners about feline weight loss will attest, weight loss requires an holistic approach. a guide ensures that none of those details are missed, and the owner can refer back to this very accessible manual in their own time. The book is illustrated throughout with colour photographs, the most useful and dramatic of which are “before” and “after” photos of cats that have been enrolled in weight loss programs. This book is pitched at a level suitable for owners of overweight cats, but experienced veterinarians and nurses will find this an excellent reference when putting tailoring a weight loss program. The author of this review donated three images from her clinical image library for use in this publication, but does not receive any monies or royalties. Is my cat going to be at risk of illness as a result of being overweight or obese? Could I have prevented this from happening – is it my fault? How do I know that my cat is overweight or obese? Why worry about my cat’s weight? What are the general consequences of being overweight? What illnesses are associated with being overweight? What is a cat’s natural diet? What changes have occurred in the feeding behaviour and lifestyle of the modern pet cat? When are problems seen with modern diets? How do our busy lives affect the way we feed our cats? What are the consequences of the modern pet cat’s changed lifestyle and diet? How can weight be managed? SECTION 3 | how can my veterinary practice help me and my overweight cat? What information might my veterinarian need to know? How do weight loss clinics work? What happens when my cat reaches target weight? ‘Boo’ – the fat cat and the thin cat in the same house, how do we diet the right cat? Andrea qualified as a veterinarian in 2000 and has worked as a feline-only clinician for more than ten years. Andrea has authored and co-authored a number of books and articles aimed at veterinary professionals. Andrea currently lives in Australia with her family which includes several cats. Andrea’s detailed biography can be found here. Sam qualified as a veterinarian in 2002 and, like Andrea, has worked as a feline-only clinician for more than ten years. Sam has authored and co-authored a number of books and articles aimed at veterinary professionals. Sam currently lives in England with her family which includes two cats. Sam’s detailed biography can be found here.